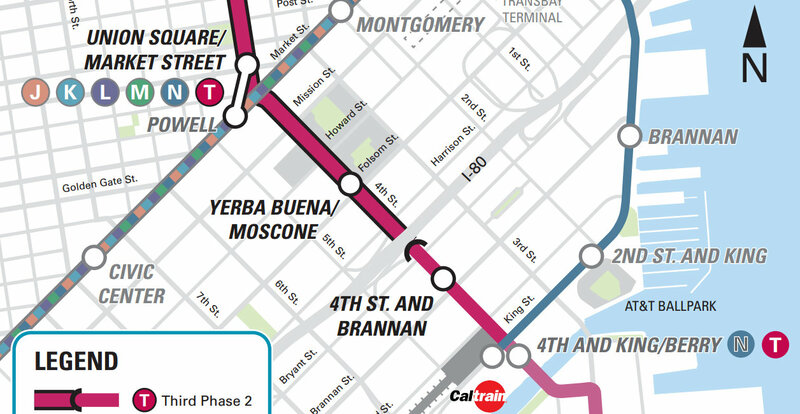 The Central Subway is coming, like it or not, and that means Fourth Street will get Muni Metro service starting in 2019. With that in mind, the SF Planning Department recently released the draft Central SoMa Plan (formerly known as the Central SoMa Plan), which sets the stage for upzoned transit-oriented development near new stations and street improvements to accommodate a growing population in a rapidly changing section of SoMa. The Central SoMa Plan, which encompasses one section of the broader Eastern Neighborhoods Plan, is aimed at creating a more people-friendly SoMa — a district which was primarily industrial until recent years. Streets that have served as car traffic funnels since the mid-20th century would be overhauled with improvements like protected bike lanes, new crosswalks, wider sidewalks, transit-only lanes, and two-way traffic conversions. 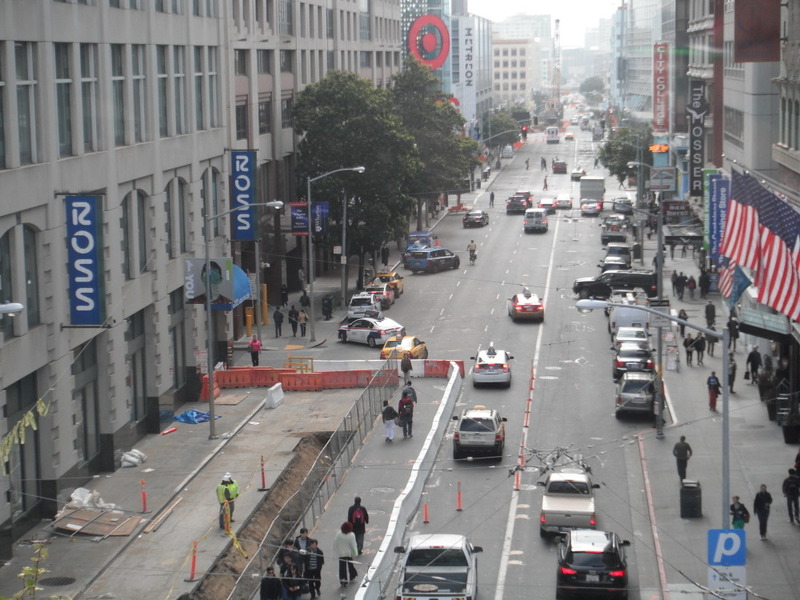 Livable City Executive Director Tom Radulovich said the plan seems to be mostly on the right track, though it should include greater restrictions on new car parking that are more in line with the plan for the adjacent Transbay District adopted last year. “With as much development as is planned, and with a desire to reclaim SoMa’s mean, traffic-sewer streets for people and sustainable transportation, the plan has to be truly transit-oriented,” he said. The plan calls for reducing traffic lanes and on-street car parking to make room for improvements to transit, biking, and walking. Ben-Pazi said the environmental review process for all of those projects would be completed as part of the plan, which is currently set to be adopted in late 2014. 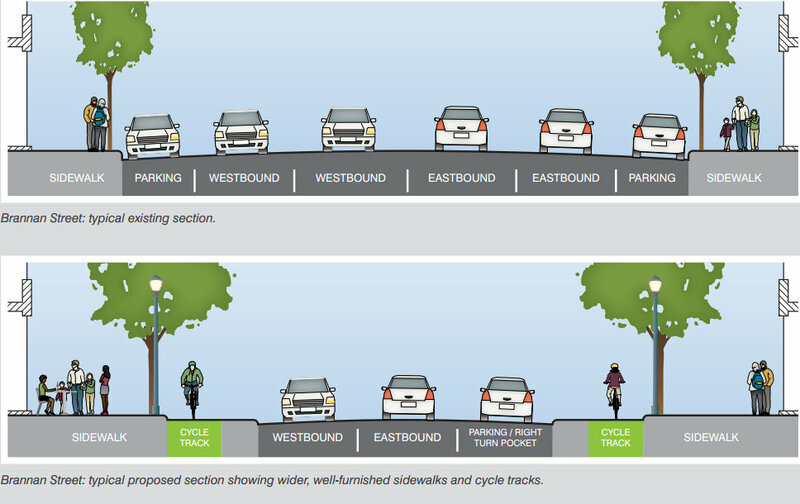 Planners propose installing raised, protected bike lanes on Howard, Folsom, Brannan, Third and Fourth Streets. 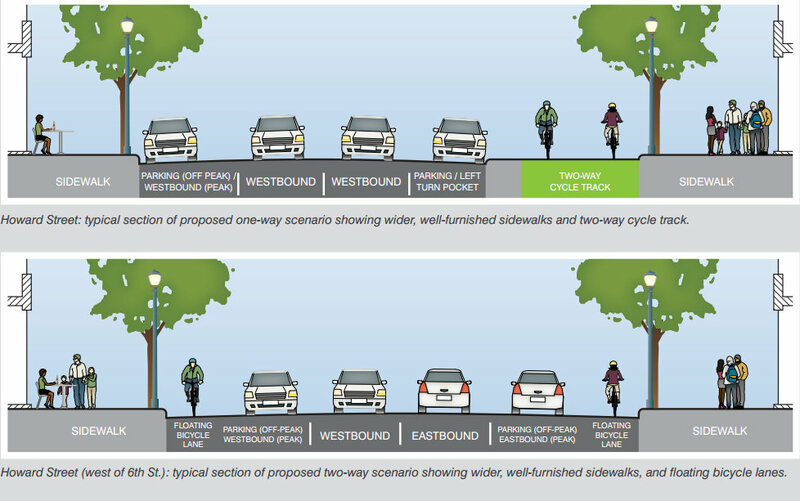 Howard and Folsom could also be converted to two-way traffic flow, but in that case, Howard would receive part-time, un-protected curbside bike lanes instead. 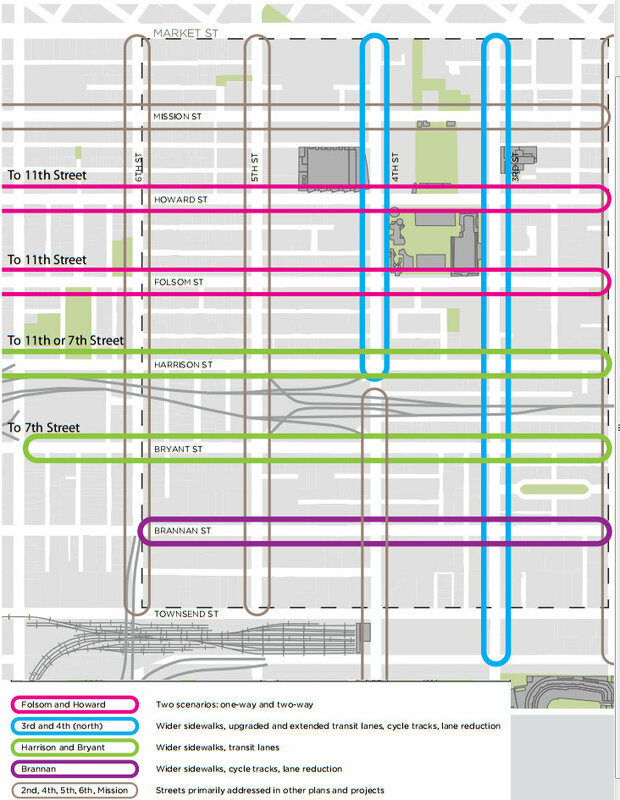 The Fourth Street protected bike lanes, however, would only run between Market and Harrison Streets, Ben-Pazi said, since south of Harrison, the Central Subway would run above ground, with fewer traffic lanes and calmer conditions. The plan says other nearby streets are to be addressed in other projects like the Muni Transit Effectiveness Project and the SF Bike Plan. 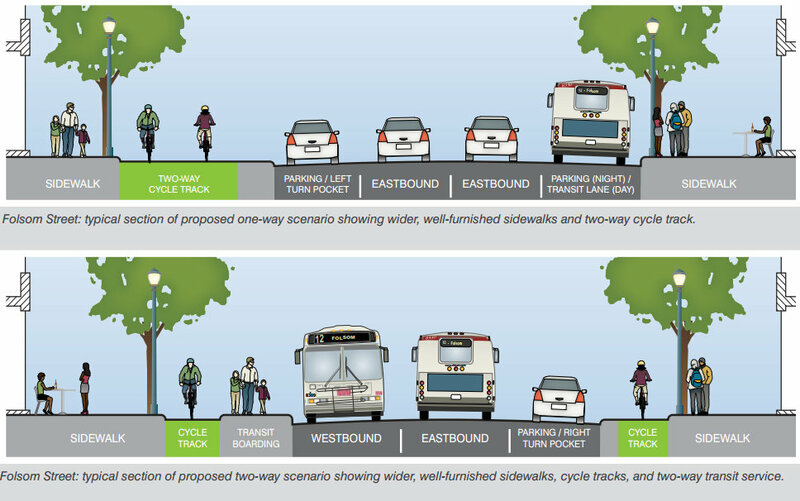 Transit-only lanes would also be added, extended or “upgraded” on Harrison, Bryant, Third, and Fourth. 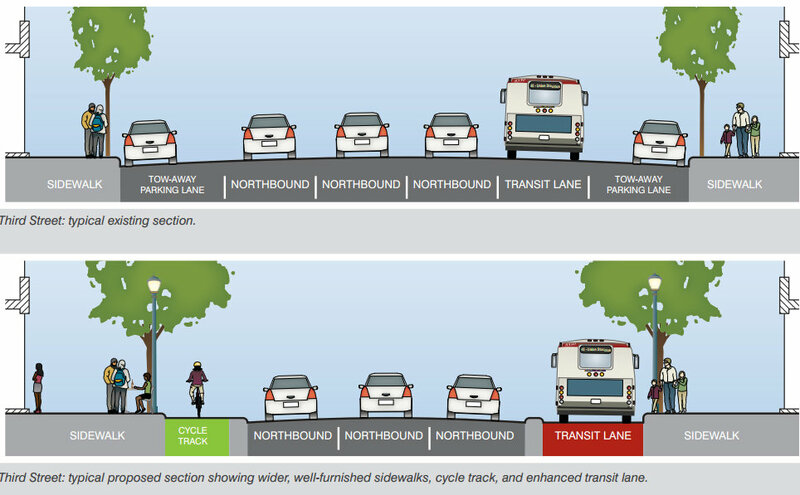 Third and Fourth would each get a colored transit lane separated from car traffic by a raised barrier on the road. All of the streets named above would get sidewalk widenings under the plan, as well as numerous new mid-block crossings with traffic signals throughout the area. Three closed crosswalks would be re-opened at Third and Byant, Third and Folsom, and at a freeway offramp at Fifth and Harrison. The ramps that touch down along highway 80, Ben-Pazi noted, make for “horrible intersections,” and appear “much more frequently” than today’s Caltrans guidelines would allow. 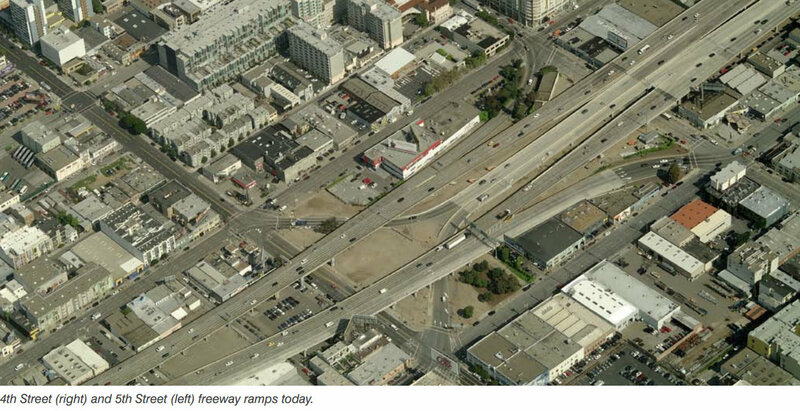 Though the prospect of removing SoMa freeway ramps is beyond the Central SoMa Plan’s scope, Ben-Pazi said it calls on the city to study the issue further. 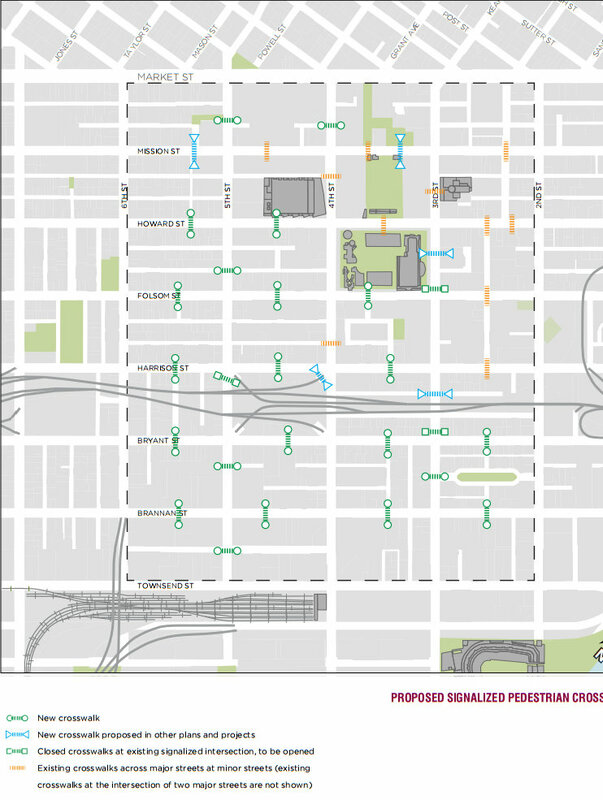 The Central SoMa Plan also calls for turning several alleyways into pedestrianized public spaces, creating new parks, as well as adding more alleyways required as part of new development. Ben-Pazi said the Planning Department expects the impact fees from increased development to fund most of the street improvements called for in the plan. In a blog post, Sarah Karlinsky, deputy director of SPUR, praised the plan overall, but said it should allow for more high-rise office and residential development than is currently proposed. Radulovich, however, doubts the Central Subway will provide enough of an increase in transit service for the level of intensive development SPUR would like to see. The proposed design for Brannan. It’d be amazing to see this come to life, but unfortunately without funding, with a long EIR process, and undoubtedly a target of lawsuits and complaints, this is going to take time. We need a plan to get this rolling. Much like downtown oakland, there is WAYY more street space than we need. Much of this could be better utilized. Imagine if our barren downtown streets became boulevards! i love the concepts for the street redesigns and it sounds like a paradise compared to the current abysmal conditions. I notice parking is often removed to make room for wider sidewalks and bike lanes. I am 100% in favor of this, but I wonder the extent to which the concepts will be watered down or simply left incomplete as plans to redesign Folsom have been. As a renter in the area, one big concern I have is that the development required to complete these projects might lead to a lot of displacement of current residents. Also, like Radulovich I find that a lot of the construction in the area and Mission Bay as well as development from recent years or planned development has excess parking capacity and advertises proximity to the freeway as a selling point. On a positive note, I’m glad to hear Jane Kim talking recently about growing support for a congestion fee, it’s definitely another way of paying for these upgrades or better/expanded transit service. I say start striping those new crosswalks today. Even without the ped-activated signals, they would slow traffic considerably and be a harbinger of things to come. No complaints about the potential risks to peds–those of us who live and work down here already routinely cross mid-block even without official sanctioning. This would improve the safety. The entire freeway structure was just rebuilt from scratch. It’s too bad someone didn’t think of redesigning the ramps before Caltrans started pouring concrete. This Week: Will Board of Supes Approve 8 Washington?